The ‘Fountain Sandstone’ walls carved by South Boulder Creek, of Eldorado Canyon State Park, just 15 min from Downtown Boulder, CO are where some of America’s most famous rock climbing stories were written and legends were made. In the 1970’s Eldo Canyon, as it’s affectionately known amongst the climbing community, was where iconic rock climbers like Layton Kor, Huntley Ingalls, David Breashears, Jeff Achey, and the late great Derek Hersey (to name a few) could be found amongst the unique lichen covered red walls and their famed tilted geologic formations. Both awe-inspiring and humbling, the climbing in Eldorado Canyon is unique and like no where else. Today, thanks to many decades of route development from the local, strong Boulder / Denver climbing community, Eldo now sports over 500 routes of which to enjoy this beautiful and unique climbing treasure and state park, just mere minutes from the growing metropolis of Boulder, Colorado. Whether a seasoned climber looking to experience the best of what this place has to offer on a limited time schedule, a fledgling trad and multi-pitch climber looking for more mileage with the tutelage of an IFMGA licensed mountain guide, or the indoor climber looking to foray onto outdoor rock, and get way off the ground to experience the thrill of exposure and sweeping vistas, Eldorado Canyon’s plethora of high quality and classic routes from 5.5 – 5.10 have something for everyone. 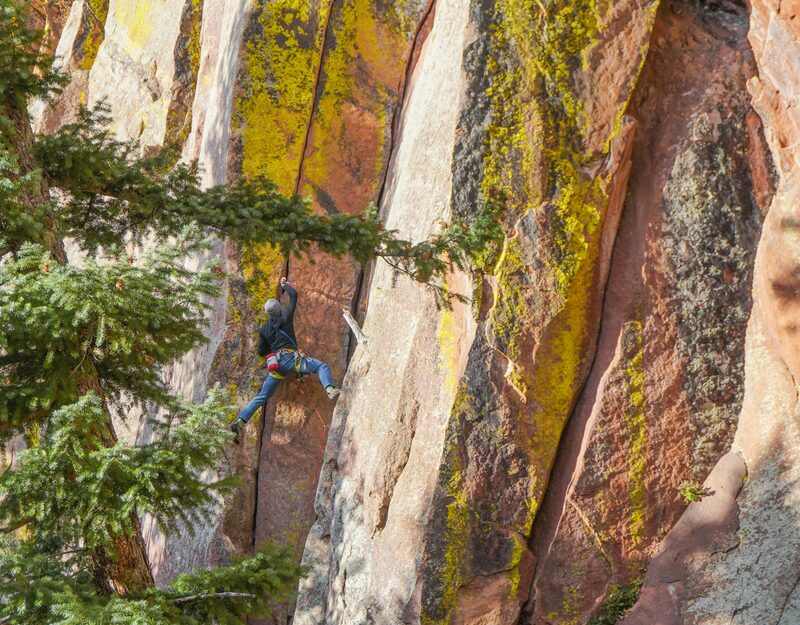 And then of course, there is Colorado’s (and arguably one of America’s) most famous 5.11 rock climbs… The Naked Edge. Although generally considered much easier climbing then the more sheer walls of nearby Eldorado Canyon, The Flatirons, of which is the namesake of the Boulder, CO skyline, offer much more moderate, long multi-pitch routes of up too 1000’ (300M), just minutes from Downtown. With sweeping views of the higher Indian Peaks and famed Rocky Mountain National Park to the West, nestled in the Colorado front range foothills, The Flatirons, offer some of the highest quality, continuous long multi-pitch climbing adventures at accessible and enjoyable grades for climbers at all ability levels. (970) 901-9763 or click here to make a trip inquiry. Excellent couple of days getting to spend time climbing with you. I hope to be able to do it again sooner rather then later.